And it's time for Congress to recognize that. Does anyone seriously doubt that, if Detroit were a “too big to fail” bank, it would have been bailed out long ago? Or that its pensioners, rather than facing the threat of cruel cuts as part of Michigan Governor Rick Snyder’s scheme to steer the city into brutal bankruptcy proceedings, would instead have pocketed hefty bonuses? If the 2008 bailout of the biggest players in the financial sector—and policy-making over the ensuing years—tells us anything, it is that Congress and the Federal Reserve take care of Wall Street. America’s great cities? Not so much. This does not mean that a bailout on par with what the bankers got is in the offering for struggling cities and counties across the country. Not on John Boehner’s watch. Yet, Washington cannot avoid this issue and expect the United States to return to robust economic health. The link between the economic viability of American cities and the economic viability of America is too great for that. To this end, President Obama and serious members of Congress must speak up about the vital importance of federal interventions not merely on behalf of cities but also on behalf of the people who live in major municipalities that cannot be allowed to fail. Cities and counties provide front-line services to tens of millions of America’s most-vulnerable citizens, and municipal employees and retirees use the checks they have earned providing those services to keep local economies functioning. Austerity cuts, whether they are imposed by appointed officials with no other options or bankruptcy courts, do real damage far beyond the cities where they are imposed. The urgency of Detroit’s circumstance has highlighted the need for what one Congressman calls a “rethink” of Washington’s approach to cities that—for all their troubles—remain essential engines of the American economy. This rethink must, necessarily, recognize that the era in which Washington can neglect American cities and expect the American economy to survive unscathed is finished. The headlines from Detroit tell us as much. But it’s not just the Motor City. Detroit is in the news because of Snyder’s move. But Detroit is not alone—not in a country where more than 80 percent of Americans now live in urban areas, and where communities from California to Alabama are wrestling with bankruptcy processes. 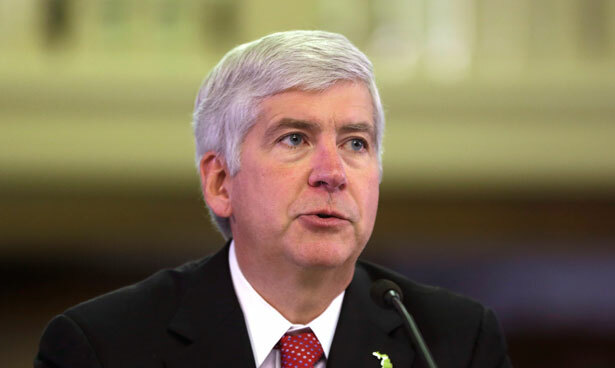 Michigan Governor Snyder has targeted Michigan cities outside Detroit for state-imposed austerity, using an “emergency manager” law that he reworked and reinstated even after Michigan voters scrapped a similar measure in a 2012 statewide referendum vote. Beyond Michigan, in states across the country, major cities teeter on the brink of insolvency. No one suggests that officials in Detroit or Saginaw or Flint—or the other struggling American cities—did everything right. But only the most deliberately disengaged commentator would imagine Washington to be blame-free in all this. America’s urban communities—and many not-so-urban communities—have for decades been battered by free-trade policies that foster deindustrialization, by tax policies that encourage offshoring, by all the missteps and misdeeds of Congress and successive presidents. “I would ask if you would think about how you would advise Congress or how the Fed itself might pursue policy that would have the effect of potentially avoiding—but certainly mitigating—the economic effect of municipal financial failure,” Kildee told Bernanke at a House Financial Services Committee last week. Since his election to Congress in 2012, Kildee has been warning Washington that the crisis faced by cities extends far beyond the headline-grabbing troubles faced by Detroit. The “rethink” that Kildee proposes is rooted in an understanding that failing cities undermine the states in which they are located—and the nation as a whole. And, he argues, there are ways to intervene. Kildee’s not alone in stepping up. He’s one of the newest members of Congress, but in the struggle to aid Detroit, he’s joined by one of the senior members: Congressman John Conyers, who has represented the Detroit area since the mid-1960s. Conyers warned long ago that free-trade policies would devastate American cities, and he’s been a steady advocate for investment in urban America. But now, he says, Congress needs to recognize and respond to the risks that arise when municipalities are in crisis. In particular, Conyers is interested in examining the role that financial distress and bankruptcy pressures play in assaulting pension rights and in hastening the privatization of essential public services. As Conyers notes, the pressure to privatize is often at odds with the public interest in transparency and the long-term stability of communities. There are already plenty of politicians stepping up to say what Washington can’t do in response not just to Detroit’s needs but also to those of hundreds of cities and counties nationwide. But that’s austerity talking, not common sense. Common sense says that the federal government, which has played a part in undermining the economic prospects of American cities, needs to start playing a useful role. Are Governor Rick Snyder's actions in Detroit an "affront to democracy" or merely tough but necessary decisions?